Nicotine or e-cigarette use markedly increases the risk of abdominal aortic aneurysm, a disease which has a mortality rate of over 85%. Excess body weight is among the leading causes of death and disability in the U.S., with burdens expected to increase. Overweight and obesity predispose individuals to most major risk factors, including hear diseases, hypertension, hyperlipidemia and diabetes mellitus. Twenty-nine million people in the U.S. have diabetes and 1.7 million people aged 20 years or older were newly diagnosed with diabetes in 2012. Heart disease is the leading cause of death in the U.S. and one third of coronary heart disease deaths are attributable to smoking and exposure to secondhand smoke. No items found in feed URL: http://research.gsu.edu/category/Molecular-Translational-Medicine/feed/. You requested 4 items. 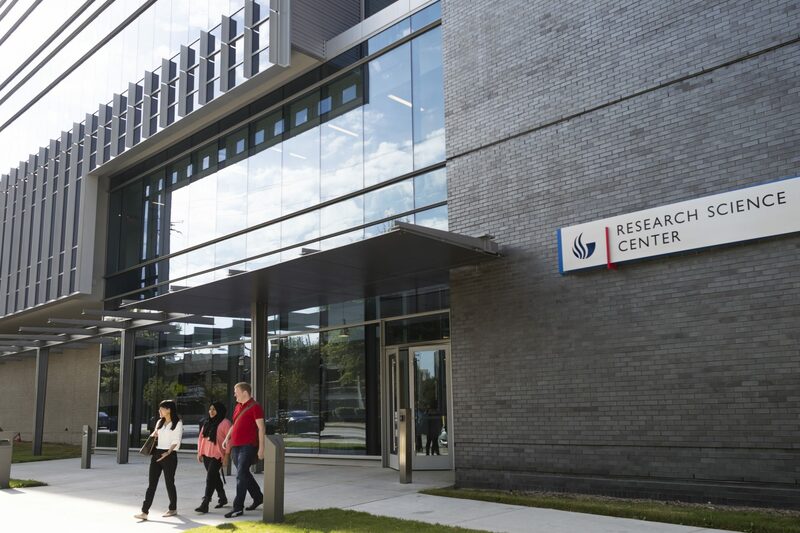 The Center for Molecular and Translational Medicine at Georgia State University meets healthcare needs by converting significant research findings into diagnostic tools and medicines to improve the health of individuals. The center is designed to help millions of people suffering from heart disease, diabetes and other illnesses. The current research focus of the center is to dissect molecular insights of cardiovascular remodeling in obesity and obesity related diseases, including diabetes, hypertension, heart diseases, and stroke, with special emphasis on the regulation of these processes. Ming-Hui Zou, an internationally recognized researcher in molecular and translational medicine and a Georgia Research Alliance Eminent Scholar in Molecular Medicine and associate vice president for research at Georgia State University, is the founding director of the Center for Molecular and Translational Medicine at Georgia State. An independent investigator of the National Institutes of Health, the Juvenile Diabetes Research Foundation International, and the American Diabetes Association, and a National Scientist Development and National Established Investigator awardee of the American Heart Association, Zou has used these (and many other awards) to make scientific observations in fields with great potential for immediate clinical relevance. We effectively transform information gained from biomedical research into knowledge improving the state of human health and disease. We have published over 135 peer reviewed articles in major, competitive science journals. We develop the next generation of scientists and help millions of people suffering from heart disease, diabetes and other illnesses. We have already procured more than $25 million in research funding from the most competitive funding sources.